northtemple - Is image a priority? 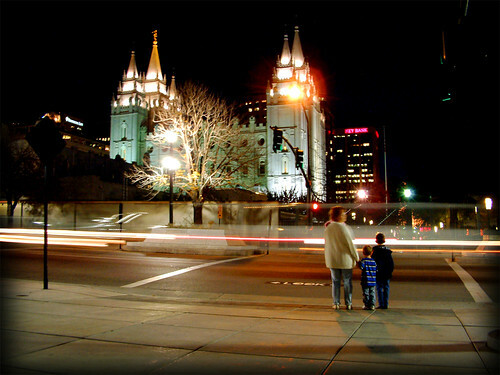 Walking through Temple Square this time of year might surprise you. A dozen of our prolific Church grounds crew are busy with ladders and lifts stringing 700,000 lights onto trees on our campus. It occurred to me today how much time and money it takes to prepare that number of lights. Once lit, the campus becomes even more of a tourist attraction, welcoming thousands of people to see the lights. It’s a big thing here. And the Church is happy to provide another reason to visit Temple Square and see who we are. We’ve got a massive water fountain outside the building that is certainly expensive to maintain. The Church has spent millions on 120+ temples, and has many more examples of money spent on the image of the Church and making sure that where we work, live, and worship is attractive and pleasing to the eye. It may seem frivolous. But it shows they put value in the image of the Church, in attracting people to the Church, and in beautifying and glorifying what we preach. Here at the office we wear full suits. White shirts, ties, jackets all required. The reason? To portray an image of professionalism, cleanliness, and reverence for what we do. Because how you look speaks volumes about who you are. It is true. I feel better when I look better (I’m treated better, too). I work better in an office that is clean and pleasing to the eye. And I feel a sense of reverence when I go to a temple that is so beautifully crafted. Does looking good matter? It does to us. And we are working hard to apply that focus to the websites and applications of the Church. A well-designed website will speak volumes about who we are. A simple and beautiful web application will help people feel the happiness and reverence of the work they’re engaged in. It is a priority. Make sure your image communicates who you are, even if it comes at a large cost or great sacrifice. To me, it’s worth it.